Home Misc. Corvette News Owner of Stolen 1977 Corvette Needs Your Help! Owner of Stolen 1977 Corvette Needs Your Help! It’s amazing what some losers will do to steal an automobile; especially when it’s a Corvette. According to The York Dispatch newspaper out of York County, Pennsylvania, a bright orange, 1977 Corvette was stolen via flatbed while it was currently undergoing some restoration work at a local shop over the Easter holiday. Owner, Charles Estelle of Thurmont, Maryland brought the car to York County to get a fresh paint job and then dropped it off in Paradise Township to have some engine work done by Corey Bollinger. Bollinger took off to Ohio for the Easter holiday and went he returned back on April 8th, the car was gone. He texted Estelle to find out if the owner had picked up the car for some reason while he was gone, but Estelle hadn’t been by since dropping the car off. The Corvette’s hood wasn’t in place at the time and the car wasn’t drivable. Since Bollinger’s garage is on a dirt road about a mile off the main road, Bollinger believes the car had to have been put on a flat-bed and towed away. Estelle said he reported the stolen car to Northern York County Regional Police, but so far, it hasn’t been found. 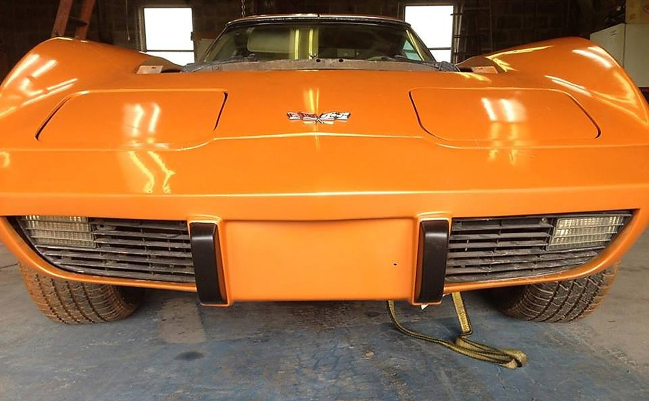 If you happen to see the missing, bright orange, 1977 Corvette possibly wearing a Maryland license plate of “SUNKSD”, call Northern York County Regional Police at (717) 292-3647.